Content by Tony Macklin. Originally published on November 1, 2018 @ tonymacklin.net. The truth always has been dependent on perception. In Charleston, South Carolina, perception hid the truth. For more than 40 years, a sexual predator Eddie Fischer, was given license by the community to dominate and abuse youth without accountability. The adults ignored any hints of what was going on in their devotion to keeping the image of their community pristine. The children had to fend for themselves, and many couldn't. Over the years, 6 males who were students at Porter Gaud School committed suicide. After being notified about the 6th suicide, Paige Goldberg Tolbach, graduate of Porter Gaud, decided to make a documentary exploring the cause, results, and lasting psychological devastation that had caused the terrible history. 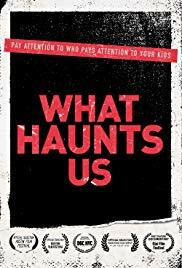 What Haunts Us - directed by Tolach with a screenplay by Mark Monroe - tears the shroud off a community. The documentary captures the lasting effects of the predator, the cost on his victims, and the slow rot of a policy of obfuscation and deceit that tries to cover up the heinous history. Paige tells us about her time at Porter Gaud, where she spent a happy, upbeat life. As she was living the good life, some other students were caught in a web woven by Eddie Fischer. Fischer was a trainer and coach who created a cult of personality. Parents loved him and children admired him. He was able to exploit the vulnerability of some of the boys, manipulating them, and sexually abusing them. Tolbach relies on interviews, but there are significant gaps. Her film has no interviews with parents, and she isn't able to get any authority on camera for an interview. If only she'd been a little bolder. But she does use a lot of footage of a male interviewing Eddie Fischer, probably for legal purposes. The amoral abuser talks matter-of-factly about his activities. He espouses glib ignorance. Tolbach has several interviews with victims, many years after their life-changing abuse. The most significant victim is Guerry Glover, who has a life-long commitment to exposing what happened to him and 42 others at the school. As an adult Glover took special action in 1997. He sent a lengthy letter to each member of the Board of Trustees at Porter Gaud revealing what Fischer had done, but they all ignored or rebuffed his attempts. "They just didn't care," says Glover. Earlier another victim quotes Glover's "most chilling quote," He repeats Glover's comment, "You're dying to tell someone about it, but you're scared to death that anybody will find out." But some children knew first-hand. And it destroyed their adulthood. It seems only two parents found out - from a potential victim's older brother, and they went to the principal and threatened exposure. The school let Fischer leave without sanction. The principal was his ally. A cruel fact of irony is that Guerry Glover had himself expelled to get away from Fischer, and Fischer wound up at his new school. Ultimately Fischer meets justice, after 40 years. And the school also receives overdo justice. But the wound is still raw. What Haunts Us has a power that lasts far after one views the film. It is a metaphor of what happens when truth disappears down the rabbit hole. Absurdity and amorality rule. Abusers make the rules. Perception protects abuse. At the end Paige Goldberg Tolbach shifts her attention to us. She wants to warn us. Unfortunately, at the end the impact isn't what it could be. There is an image of various, contemporary newspapers with headlines about abuse. They're scrambled, instead of focused. We are left to sort it out.